What does this mean – God forbid that I should glory, save in the cross of our Lord Jesus Christ, and we have this treasure in earthen vessels?. Exaltation of the Cross. Synopsis: On this Sunday before the Exaltation of the Cross, two of the epistle readings (2 Corinthians 4:6-15 and Galatians 6:11-18) relate directly to the cross. St Paul states emphatically: "God forbid that I should glory, save in the cross of our Lord Jesus Christ." What does it mean to "glory" in the cross? People glory in many things – wealth, attractiveness, popularity, political correctness, having a good marriage, job, etc. None of these things is glorying in the cross. We answer this important question, and also why we who are "new creatures" because of the cross "have this treasure in earthen vessels". Galatians 6:11-18 11 Ye see how large a letter I have written unto you with mine own hand. 12 As many as desire to make a fair shew in the flesh, they constrain you to be circumcised; only lest they should suffer persecution for the cross of Christ. 13 For neither they themselves who are circumcised keep the law; but desire to have you circumcised, that they may glory in your flesh. 14 But God forbid that I should glory, save in the cross of our Lord Jesus Christ, by whom the world is crucified unto me, and I unto the world. 15 For in Christ Jesus neither circumcision availeth any thing, nor uncircumcision, but a new creature. 16 And as many as walk according to this rule, peace be on them, and mercy, and upon the Israel of God. 17 From henceforth let no man trouble me: for I bear in my body the marks of the Lord Jesus. 18 Brethren, the grace of our Lord Jesus Christ be with your spirit. Amen. 2 Corinthians 4:6-15 6 For God, who commanded the light to shine out of darkness, hath shined in our hearts, to give the light of the knowledge of the glory of God in the face of Jesus Christ. 7 But we have this treasure in earthen vessels, that the excellency of the power may be of God, and not of us. 8 We are troubled on every side, yet not distressed; we are perplexed, but not in despair; 9 Persecuted, but not forsaken; cast down, but not destroyed; 10 Always bearing about in the body the dying of the Lord Jesus, that the life also of Jesus might be made manifest in our body. 11 For we which live are alway delivered unto death for Jesus' sake, that the life also of Jesus might be made manifest in our mortal flesh. 12 So then death worketh in us, but life in you. 13 We having the same spirit of faith, according as it is written, I believed, and therefore have I spoken; we also believe, and therefore speak; 14 Knowing that he which raised up the Lord Jesus shall raise up us also by Jesus, and shall present us with you. 15 For all things are for your sakes, that the abundant grace might through the thanksgiving of many redound to the glory of God. Sunday Before the Exaltation of the Cross We are saved from the poison of our passions and sin through the Cross. Exegesis of John 3:13-17. Text and Audio. We are saved from the poison of our passions and sin through the Cross. He’s speaking of Himself. He was standing right before them when He spoke to them; but He’s also God, so He is in all places at all times. This standard with the brass serpent in the wilderness is described in Numbers. The people were complaining about being a long time in the desert. They had been gone for many years because of their sins. The actual distance between Egypt and Israel is long; it is about a week’s walking journey, and yet it took them forty years because of their sins. They were well into this trip by then, and they were complaining to Moses, and the Lord sent fiery serpents upon the ground, and they bit the people, and they were dying from poisonous snake bites. The Lord told Moses to make a fiery serpent and put it upon a staff; so Moses did, making a brass serpent. And the instructions were that anyone who had been bitten could look upon this standard and live. And of course, this is a type of the Cross, a foreshadowing of the Cross. Lifting up the serpent on a staff, obviously very much like a cross. And the people were saved by looking to the cross. So the Son of Man would be lifted up as well. And we can be saved by looking to this Son of Man, the Son of God, the son of David, Jesus Christ, the Only Begotten, when we look upon Him on the Cross. He had just spoken about poison. Serpents had bitten people and the poison was in their system and was killing them, but the cross saved them. So this image of poison is true for us too. Our poison is sin. Our poison is passions. We are saved from our passions and sin through the Cross. Because the Son of Man has the authority to lay down His life and to take it up again. And He would shortly lay down His life and take it up again. He has the authority to change our nature such that we no longer would be held by death. That is what happened after His death on the Cross. He descended into Hades of His Own will and filled Hades with His divinity and broke the gates of Hades. We sing about this in Pascha, and actually we sing about it every Saturday evening. And in breaking those bars, breaking the bonds that hold humanity when they die, He made us capable of ascending. So this is eternal life: To be saved by Jesus Christ, the One Who hung on the Cross as a symbol for all generations. What an incredible symbol! Can you think of a better symbol – Our Lord looking down upon us and saving us? Now we adorn our houses and our churches and our breast and everything else with the Cross. But we must understand what the meaning is: the Cross saves, because we need Jesus Christ to change our nature. And that’s what He did when He was up on the Cross. The Cross and the Resurrection must be spoken of in the same context, in the same sentence, in the same breath. When you look at the Cross, you should see the Resurrection because the Lord allowed Himself to be crucified so that He would go down to Hades and break it. I’ve spoken of this word “belief” many times. This is one of the most misunderstood words ever. To believe is not just to know something that’s true. To believe is not to think something is true. Belief is to live according to what is true. So when you look at the Cross, there should be many things that go through your mind. I don’t mean necessarily discrete thoughts because thoughts are really not capable of expressing the meaning of the Cross, however the soul knows. Eternal life is possible because of our Lord’s death on the Cross. So when you look to the Cross, look to the source of your salvation, and note that the original cross, shall we say, or one of the original crosses, one of the many types of the crosses in the Old Testament, was this standard with the serpent on it. And the people were saved from the poison that was in their systems. And there is poison in you. And that poison, the Lord wants to have obliterated, and that poison is sin and passion. This is the road to salvation: To look upon the Cross and to desire to follow the way of the Cross, which is our Lord’s way. And may God help you. Now, remember that tonight at two o’clock we’ll have vigil for the Exaltation of the Cross. This is a very, very important service. At the end of the service we prostrate ourselves before the Cross, and then we stand up again because the Cross is the source of our resurrection. It is one thing to talk about it, but it is another thing to live it. You should be living in the Resurrection right now today, brothers and sisters, living for eternity, not for anything temporary. You’re no longer creatures of the earth, but you’re creatures of Heaven. You’re citizens of the Heavenly Kingdom now. And indeed in the Divine Liturgy we are in the Kingdom at this very moment, although you might not feel it; it’s only because of what’s wrong with us that we don’t feel it; because it is true. So may God help us to follow the way of the Cross and to be saved. Amen. Transcribed by the hand of Helen; may God save her and her loved ones. 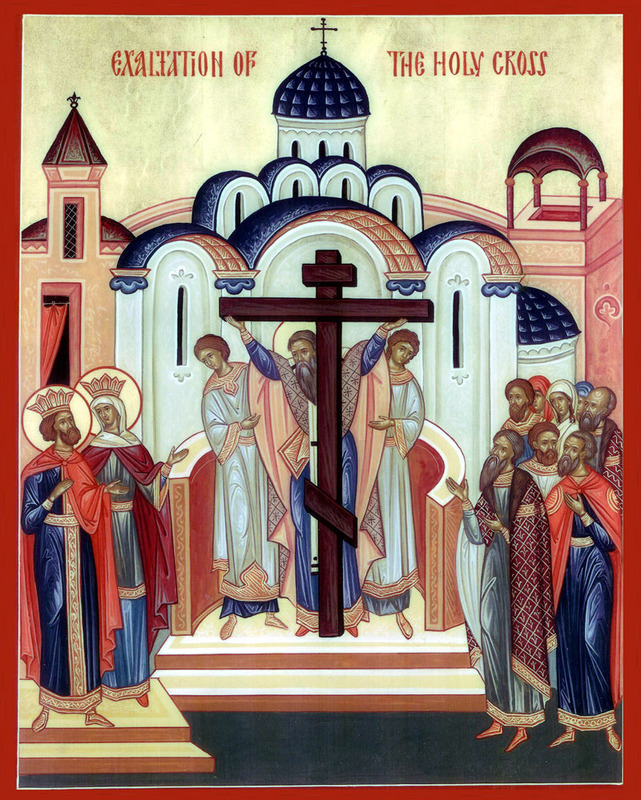 The Exaltation of the Precious Cross is celebrated on Sept 14 (Sep 27 on the civil calendar). The service is very similar when the cross is also commemorated on the third Sunday of Great Lent. 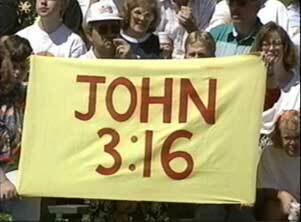 John 3:16, “For God so loved the world, that he gave his only begotten Son, that whosoever believeth in him should not perish, but have everlasting life.” It was common in the seventies to see these signs (with the verse or just the verse reference) unfurled in the end zone when an extra point was being kicked in football games. Numbers 21:5-9 And the people spake against God, and against Moses, Wherefore have ye brought us up out of Egypt to die in the wilderness? for there is no bread, neither is there any water; and our soul loatheth this light bread. (6) And the LORD sent fiery serpents among the people, and they bit the people; and much people of Israel died. (7) Therefore the people came to Moses, and said, We have sinned, for we have spoken against the LORD, and against thee; pray unto the LORD, that he take away the serpents from us. And Moses prayed for the people. (8) And the LORD said unto Moses, Make thee a fiery serpent, and set it upon a pole: and it shall come to pass, that every one that is bitten, when he looketh upon it, shall live. (9) And Moses made a serpent of brass, and put it upon a pole, and it came to pass, that if a serpent had bitten any man, when he beheld the serpent of brass, he lived. A “type” is an allegorical foreshadowing of a future event or person. 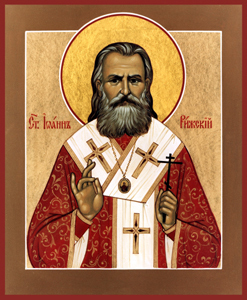 You cannot read more than a page in the Old Testament without encountering one, and all the important types – regarding Christ, the crucifixion, the virgin birth, baptism, etc are mentioned in the hymns of Orthodox services – particularly in Vespers and Matins. There are literally hundreds of examples. Every Sunday we celebrate the resurrection with dozens of hymns that describe the event of the resurrection, the cross, and all their implications in Vespers and Matins for Sunday. Pascha hymnology is full of this teaching too. Perhaps the best and most clear example is the Paschal troparion: “Christ is risen from the dead, trampling down death by death, and upon those in the tombs bestowing life”. Normally Christians do not prostrate themselves on Sunday. Why? What is a prostration? On the Sunday of the Holy Cross we do prostrate. Why and when? Before Thy Cross, / we fall down in worship, O Master, / and Thy holy Resurrection / we glorify. When we prostrate, it is in worship of the Risen Lord, and when we raise ourselves up, we recall the resurrection. A Christian prostrates when he makes the sign of the cross, and falls to his hands and knees (it is usually easier to have the hands touch the floor a moment before the knees), and bows his head to the ground, then gets back up. The Exaltation of the Cross was Monday that year. I have often struggled with a way to get people to attend vigil on Sunday because many do not want to go home and then come back. I cannot say that any solution has been satisfactory – either serving vigil early in the afternoon, after we have eaten breakfast, or serving at the usual time at night. Synopsis: The Epistle and Gospel for the Sunday after the Exaltation of the Cross both contain identical 'definitions' of Christianity. They both involve the cross, which is an instrument of death and of life. All Christians must voluntaily be crucified with Christ, and tak up their cross. This is explained by our Lord's instruction that we must 'lose' our life to save it, and His uestions: For what shall it profit a man, if he shall gain the whole world, and lose his own soul? Or what shall a man give in exchange for his soul? We must understand this if we are to truly live the Christian life and know Christ. SYNOPSIS:A line by line exegesis of the important passage John 3:13-17, with particular emphasis on how the cross and the resurrection must be thought of in the same "breath;", and how we must live because of the cross. Homily on the Exaltation of the Holy Cross We preach Christ crucified What is the way of the cross? 1 Corinthians 1:18-24. Text Homily. What is the way of the cross? So says the Apostle. We also preach that the Lord Jesus Christ crucified just as he did. What is the preaching of the Cross? The preaching of the Cross is preaching about the way of the Cross. Our Lord spoke about the way of the Cross. It’s rather mysterious, really. And the reason it’s mysterious is because of our sins, because the way of the Cross is the way of life; and yet, in order to gain it, we must die. The way of the Cross is the way of joy — or to joy. But in order to gain it, we must undergo tribulation and be sad. The world does not understand this. It is foolishness to them. To the world, when someone takes something from you, take it back. To the world, when something is good for you, it is good, no matter whether it’s bad for someone else. To the world it is: I take what is mine. To the world it is: No one should treat me in this kind of way, whatever way we don’t enjoy or don’t like or think is beneath our station. To the world: When you have an enemy, you fight him. The way Christians live with their enemies, the way Christians do not strive after or shouldn’t strive – a true Christian, that is — after only things that they desire: The world doesn’t understand this; it’s foolishness. And the reason I say, “The way of the Cross is a mystery” is because, to a large extent, we don’t understand either. We know what is right, but our sins obscure from us the real truth of the matter. How can this be otherwise? Just look at your life. You know that, as a Christian, you should forgive everyone; and yet when someone slights you, what is your first response? Just like the world: To be angry, to judge. Perhaps, with reaching some maturity in the way of the Cross, you wouldn’t reach out against this person, but still the thought is there. The way of the Cross is the way that Jesus Christ lived. When we preach the Cross, we preach the One Who is on the Cross. We preach the way of life of the One Who is on the Cross. He taught us the way to live. The way to live is to turn your other cheek when your enemy slaps you on your cheek. The way to live is to love your enemies and to not fight against them. The way of life is to humble yourself, to not seek after the things that the world thinks are so pleasant and so alluring, and yet are so ephemeral and will go away. This is the preaching of the Cross. This is the way of the Cross. The way of the Cross is also taking on the yoke of our Lord Jesus Christ. But He said, it’s easy and light. The way of the Cross is not easy and light. This is where the mystery comes in. This is where the Christian begins to understand, in living his life, what the Lord means by “the way of the Cross” and by His promises that in the world we will have tribulation and then also promising that His yoke is easy and his burden is light. Truly, to be holy is to have an easy way and a light way and a restful way. That is absolutely true. The problem is that we who are trying to be holy make many missteps. And we must have tribulation in order to learn to become holy. So this way of the Cross is difficult. Our Lord’s way, the yoke of Christ, is easy and is light. When oxen follow their master’s command, it is quite easy for them. When they chafe against the yoke, when they’re disobedient, when they’re recalcitrant, then the yoke chafes them, bruises them, hurts them. So it is with us. Our Lord’s yoke is easy and light. And the way of the Cross is difficult, because of us, and because of the world. This is a mystery that is difficult to penetrate. It is difficult to understand: Why should I delay my personal gratification when there is no immediate reward? The world doesn’t understand this. Many times, let’s be honest with ourselves, we don’t either, which is why we sin. But the more we learn of our Lord’s yoke, the more we follow Him in every way, unfortunately, for us, there is going to be pain and difficulty, because every Christian must have a Cross. I tell you right now, if you do not feel pain in your heart about the world, about the person you are and the person you should be and the difficulties that you have (I’m not talking about whether or not you don’t have enough money to pay the electric bill. I’m not talking about that. I’m talking about deep in your heart, feeling the kind of person you are) — If you don’t feel pain over that, then be afraid. Be very afraid, because you cannot be saved unless you know that there is a better way and you know that you’re lacking completeness and wholeness. The way of the Cross is to feel pain. Not self-inflicted pain; we’re not masochists, but pain because things are not the way they should be, neither in your heart, nor the hearts of your loved ones, nor the hearts of those in the world. It’s not the way it should be. So the way of the Cross is to always be aware of this. The Lord was walking the way of the Cross from the moment He was born. His face was always set to Jerusalem , and so should we, according to our meager abilities which increase with time. You must feel in your heart that you’re lacking something in order to desire what you need. This is the way of the Cross: To know that you are missing something that is so critically important to your soul; to know that you’re missing wisdom and compassion and gentleness and humility and wholeness. And that the only way to gain this is to follow Christ and to cleave to Him, to hold onto Him, no matter what. If you think your life is relatively easy right now, then be afraid. No one’s life should be easy, not in this world. It doesn’t matter if you are rich or poor, sick or healthy; the Christian must feel deeply with his soul how things are out of order. Our Lord did. That’s all He thought about in the world. We call him “The Man of Sorrows.”  We have the tradition that He never laughed, because all He could think about was those who He loved and what they needed. So all we should think about is what He thought about: Love for others without consideration for ourselves. That’s the way of the Cross. It’s good to be before the Cross and to bow down before it and to have beautiful singing, decorate the church and all the other things that are beautiful in our faith. But if your heart doesn’t ache for what you should be and what others should be, then you’re not following the way of the Cross. Cultivate this pain; don’t be afraid of it. The world doesn’t want to feel pain. Our Lord did, every day, every moment. So did the Apostles, so did the Saints. And eventually they found perfect peace. You cannot find perfect peace without going the way of the Cross. And in the world the way of the Cross is not peaceful, because the world hates the Cross. Oh, it’s okay to wear it in an earring or as a tattoo, but they hate the way of the Cross. And if we are honest with ourselves, we have to admit, there are many times when we do not want to go the way of the Cross either. Because the way of the Cross is difficult and painful. But let us ask God to help us to follow the way of the Cross, because this is the only way to life. What we see around us in the world: Most of it is death, most of it is meaningless and diseased. If we look even in ourselves, we see that there are meaningless and diseased things even in our own souls. God came so that: Nothing would be meaningless; everything would have meaning; there would be no disease; everything would be made whole and perfect. And so let us follow the way of the Cross. It is the only way to perfection. God help us. Amen. Transcribed by the handmaiden Helen. “And it came to pass, when the time was come that he should be received up, he stedfastly set his face to go to Jerusalem, (52) And sent messengers before his face: and they went, and entered into a village of the Samaritans, to make ready for him. (53) And they did not receive him, because his face was as though he would go to Jerusalem.” (Luke 9:51-53). Jerusalem is also a symbol of righteousness. Sunday after the Exaltation 2009. Audio Homily. Exaltation of the Holy Cross. We preach Christ crucified. Audio Homily 2009. 1 Corinthians 1:18-24 18 For the preaching of the cross is to them that perish foolishness; but unto us which are saved it is the power of God. 19 For it is written, I will destroy the wisdom of the wise, and will bring to nothing the understanding of the prudent. 20 Where is the wise? where is the scribe? where is the disputer of this world? hath not God made foolish the wisdom of this world? 21 For after that in the wisdom of God the world by wisdom knew not God, it pleased God by the foolishness of preaching to save them that believe. 22 For the Jews require a sign, and the Greeks seek after wisdom: 23 But we preach Christ crucified, unto the Jews a stumblingblock, and unto the Greeks foolishness; 24 But unto them which are called, both Jews and Greeks, Christ the power of God, and the wisdom of God. In the Night of October 12, 1934. This revelation of the Lord concerning the sufferings which awaited Him, struck His disciples like a thunderclap from a clear sky. Earlier, He had told them that His path was also their path: The servant is not greater than his master. "He who does not take up his cross and follow after Me is not worthy of Me" [Mt. 10:38]. And in the lives of Christ’s true disciples there is a time of suffering passion when each must enter his own Jerusalem, ascend his Golgotha and the fateful cross, and take up the fateful cup – even unto death. And this is not surprising, for after all, the Great Sufferer Himself prayed: "If it be possible, take this cup from Me" [cf. Mt. 26:39; Mk. 14:36; Lk. 22:42]. This "must" is altogether necessary and we are powerless to stand against it. "From that time, Jesus began to show to His disciples that it is necessary for Him to go away to Jerusalem, and to suffer many things…." [Mt. 16:21]. If the way of the Lord leads to Jerusalem, if His fate is to be decided by the scribes, the Pharisees, the elders, then it is natural that He must suffer and be killed. This Jerusalem towards which Christ directed His steps is not the Heavenly Jerusalem, but an earthly city filled with the spirit of this world, which had fallen away from its God, not recognizing, not comprehending the visitation of the Lord. This is the same Jerusalem which, at the altar of the Lord, killed the prophets and stoned those who were sent to it [cf. Mt. 23:37; Lk. 11:47-51]. And the world, my brothers, even unto this day stands on that same foundation. Perhaps it does not have the same outward appearance. Nowadays they do not crucify people on crosses as they did Peter, nor are people stoned like Stephen. People have become too indifferent towards faith to suffer for its sake. "If ye were of the world, the world would love its own; but because ye are not of the world–but I chose you for Myself out of the world–therefore the world hateth you" [Jn. 15:19]. The truth which you proclaim and which you confess and which the world cannot gainsay, or the righteousness manifest in your life which silently reproaches the world, or the peace of the Lord written on your face which the world cannot forgive, or the heavenly other-worldliness of your behavior which shames and accuses their earthly way of life – this is how you have offended the world. And the world would sooner pardon you of ten vices and crimes which get you on a level with others, than forgive one good deed which elevates you above the rest. Why did Cain murder Abel? Because Cain’s actions were evil and the actions of Abel were good and righteous [cf. 1 Jn. 3:12]. Why did the scribes and Pharisees condemn the Savior? Because He was Light and darkness cannot abide the light [cf. Jn 3:16-21]. Do not be astonished then, my dear brothers, if the world hates you. It is to be expected. This is nothing unusual. Do not let evil mockings and the vicious hatred of evil doers lead you astray. Go along the straight road with the name of the Lord, through the world which lies in evil and think in yourself : "I must…" and the world cannot do otherwise. It would not be the world if it did not prefer the lies of its errors to truth; egoism to love; its laziness to zeal for God; worldly vanity to righteousness. I am not a disciple of Christ, not His soldier, if I do what is pleasing to everyone, if I go along the broad path together with the crowd instead of keeping to the narrow path where there are few travelers. And so let us step forward in the name of the Lord with the conscious awareness that "I must." There is another aspect to this "I must." When the Son of Man told His disciples that He must go to Jerusalem and there to suffer much and to die, He was aware that this was necessary even for Himself. Because He was obedient unto death, even death on the cross, God raised Him up and gave Him a name above every name [Phil. 2:8-9]. If the Heavenly Father so willed that even His only-begotten Son would drink from the cup of suffering, is it for us sinners who are so imperfect to shun this cup of suffering, this school of suffering, when we are such a long way from perfection and still have so much to learn in order to become worthy disciples of the Great Sufferer? Some think: ‘How much more fervently and willingly I would serve my Lord if only my life’s path were easier, if it were not so thickly strewn with sharp rocks.’ In saying this, you yourself obviously do not know who and what you are, what is beneficial for you and what is harmful, what you need and what you do not need. It is true when they say that a man tolerates least of all his own well-being. Days of happiness, days of success, when everything goes according to one’s own wishes – how many times have such days woven a fatal net which captures the soul? What dissoluteness grows on man’s heart, like rust on the blade of an unused battle-sword, or like a garden which becomes overgrown if not tended by the gardener’s shears. Tell me, O Christian, what preserves you from haughtiness which so easily penetrates even the strongest hearts, even the hearts of Christ’s disciples? Is it not the cross of suffering? What humbles the passionate inclinations of the flesh which so quickly and easily spread in times of well being and prosperity, like insects in a swamp on a sunny day? What teaches you to shun this uncleanness? Is it not the rod of misfortunes and sorrows? What arouses you from the sleep of self-assurance, lulled to sleep as we so easily are by times of happiness: Or what is more conducive to a routine of laziness than cloudless, carefree days of prosperity? At such times a storm can only be regarded as a blessing. What will draw you out of the dangerous state of insensibility? Will not sorrows? Will not illness? What tears us away from our worldly attachments, the love for the world and all that is in it? Is it not necessity and misfortunes? Do not trials teach us to take life more seriously? Do not sorrows teach us to be prepared for death? Wild brambles of the heart cannot be uprooted without the pruning shears of the Heavenly Gardener and the good fruit of truth and righteousness will not grow without the rain of tears and sorrows. "…not my will, but Thine be done, Father" [cf. Mt. 26:39; Mk. 14:36; Lk. 22:42]. And submission to God’s will is never manifested so clearly as in days and hours of storm when in the midst of menacing and frightful waves the Christian gives himself totally into the hands of Him Whose very hand holds these waves and tempests. When can the steadfastness, courage, and strength of a soldier of Christ be better demonstrated than when trials and obstacles must be turned into deeds, than in the war against evil, or in times of danger? All the noble strength of the Christian soul, of the Christian character shines forth most brightly in times of distress, misfortunes and sufferings. All the miracles of God’s grace are most evident in times when the waters of grief and misfortunes flood our souls and we are forced to recognize our helplessness, our weakness and draw all strength and understanding from Almighty God. Or, when God Himself chastises you and calls you to account, are you going to ask "what for" and "why"? Or when the Lords sends you to the school of the cross, will you say: "I have not need of its teachings"? Rather you must say: "I need this; I must go to this school of the cross; I must suffer with Christ in order to be raised with Him" [cf. Rom. 6:3-8; 2 Tim. 2:11-12]. When the Lord chastens me I must think and feel like a child chastened by the loving right hand of the Lord, like a grapevine under the pruning shears of the gardener, like iron beneath the smith’s hammer, like gold in the purifying fire. This "I must" is of God and I must not shrink from it. If you, my friends, agree to what I say, here in the house of God, then hold onto this principle when you are visited by grief, and yours becomes the way of the cross. These are basic truths which must be repeated before each bed of sickness and with each student entering the school of sorrows. Pastors know this. He who preached these truths a thousand times to others must repeat them for himself in every situation. Thou, Lord, help us to understand more fully and to plant deep within ourselves this lesson of the divine "I must." Even the ancient Greeks and other people bowed before the divine will, before sacred duty, before immutable destiny, man’s dependence upon Providence. The submission of one’s will before this divine "I must," the exact fulfillment of divine decrees – in the wise this was called wisdom, in heroes, it was courage, in the righteous, sanctity. How much more willingly must we Christians fulfill our duty when we know that we are not being led by blind faith, but by the good will of the Father which led even Christ to Golgotha and the Cross, but through Golgotha and the Cross to the glorious Resurrection. And so we must put our faith and trust in Him even when we cannot comprehend the meaning of the guidance. Mankind would have been deprived of so much goodness, such glory and blessedness, if the Savior had harkened to the voice of Peter: ‘defend yourself’. Let each soul bow before the divine "I must;" for the will of God is good, perfect, guiding all men to salvation. And you, O son of dust and corruption, bend your neck under His almighty hand before which your strength is as nothing. Trust to divine wisdom before which your light is but a dark shadow. Give yourself over to the fatherly guidance of Him who desires not enmity and sorrows, but peace and blessedness for all mankind. When you submit your thoughts and your will to His thought and will, then no cup will be for you too bitter, and no cross too heavy. You will be able to withstand it. Such is the will of God. If your spouse, children, friends, and everyone you love surround you; if they try to persuade you to have pity on yourself, not to destroy yourself – do not look at their tears, do not listen to their pleadings. Point to the Heavens and say: "Do not burden my heart; thus it is pleasing to God and I must. You are reasoning according to man’s wisdom and not God’s." And if from your own heart there cries out the voice of flesh and blood, and begins to persuade you: "…this cannot happen to you; defend yourself…" – turn away from this counsel of your own heart and follow after that which glorifies God. We can more easily bear our afflictions if we keep in mind the example of the Savior. See with what peaceful and holy determination He goes to His Passion. And then follow Him along the path of the cross until with His last breath you hear from His lips the divine words: "It is finished"[Jn. 19:30]. And then ask yourself: are not you inspired by this example? Do you not understand now the commandment: "…he who wishes to follow Me, let him deny himself, take up his cross and follow after Me" [Mt. 16:24; Mk. 8:34; Lk. 9:23]? Do you not share the conviction of that disciple who said: "I cannot wear a crown of roses when my Savior is wearing a crown of thorns"? At the cross of Christ even the most suffering souls among us can find consolation. I have endured, and even now endure much, but my Divine Savior endures still more. "Thrice was I beaten with rods; once was I stoned, thrice I suffered shipwreck, a night and a day I have been in the deep; in journeyings often, in perils of waters, in perils of robbers, in perils in the city in perils in the wilderness, in perils in the sea, in perils among false brethren; in weariness and painfulness, in watchings often, in hunger and thirst, in fastings often, in cold and nakedness" [2 Cor. 11:23-30]. See what he endured for Christ’s sake, how many times he was beaten, stoned, imprisoned, and then understand how far we are from him. Everywhere the cross is the sign of Christianity. A Christian cannot be without his cross. Amen. ST. JOHN POMMER OF RIGA AND LATVIA, LIFE AND PASSION, by Dr. Ludmilla Keller. You are currently browsing the archives for the Exaltation of the Cross category.